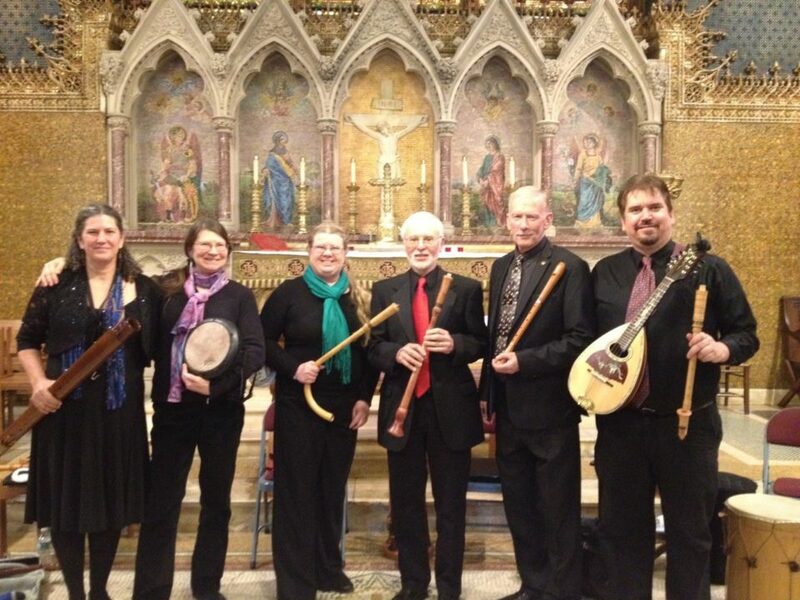 The Bleecker Consort formed in 1988 in Albany, NY and specializes in performing the surprisingly exotic sounds of medieval music as well as the lush polyphony of the Renaissance. Our performers come from a variety of professional backgrounds, including medicine, music, library sciences, astronomy, biology, and romance languages. Most of our arrangements are in the form of a “broken consort” which refers to our use of unique combinations of mixed instruments including strings, winds, voice, and percussion; we will occasionally perform a selection in a pure consort arrangement (all instruments of a particular family, like recorders). Our instruments are modern reproductions of recorders, strings (bandurria, mandola, mandolin, lute, laud, harp, hurdy-gurdy, vielle, and viol), reeds (cornamuse, kelhorn, dulcian, crumhorn, rauschpfife, shawm), brass (sackbut), and percussion (doumbeks, tambourines, castanets, frame drums). We are delighted to add appropriate vocals to much of our music. Past performances have occurred at the nationally famous Troy Music Hall, the Albany Medieval Fair, and many schools, colleges, churches, libraries, and other venues throughout the region, with the very occasional gig in Boston or Italy. The six members of The Bleecker Consort have studied with genuine masters in the field of early music, including John Tyson, Tina Chancey, Judy Linsenberg, Laura Hagen, Eric Von Heune, Susan Iodone, Dan Stillman and Sheila Beardslee, to name a few. Individual members have performed vocally and/or instrumentally with Albany Pro Musica, Ars et Amici, Schenectady Light Opera, Opera Excelsior, Opera Saratoga, Capital Chamber Artists, the University Chorale at SUNY Albany, the Saratoga Mandolin Ensemble, Averill Park Orchestra, the Troy Civic Theater, and Charles University in Prague. Our linguist holds a doctorate in Spanish and has expertise in early Romance languages. Members of the consort also belong to the American Recorder Society, Early Music America, and the Classical Mandolin Society of America. For information about contracting a concert from this exceptional consort, e-mail: bleeckerconsort@gmail.com or visit us on Facebook.